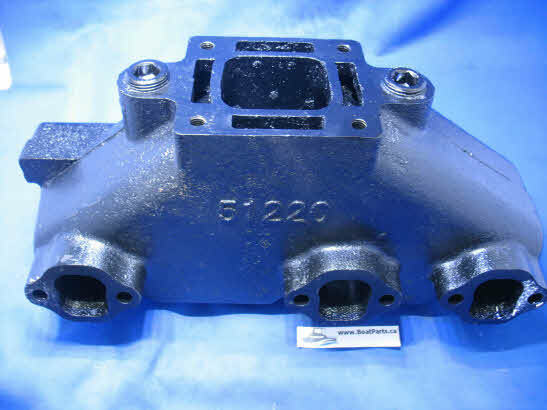 P/N 51220 port or starboard exhaust manifold. GM/Chevy V6, 4.3 liter Includes gaskets and plastic hose fitting/drain plug. P/N 51230 port or starboard exhaust manifold. GM 305/350, 5.0L and 5.7L. Gaskets included. P/N 51148 Elbow - dry joint (Iron Casting), for Generation 2 MCM GM 4.3L 262 (2002 and up, S/N 0M615000 - up). Includes gasket. P/N 51140 4 inch, 7 degree port or starboard elbow / riser. Compatible with P/N 51220 or 51230. Gasket included. P/N 51110 3 inch, 15 degree port or starboard elbow / riser. Compatible with P/N 51220 or 51230. Includes gasket. P/N 58222 Complete manifold set - replaces 4 inch elbow sets, 2 piece assemblies. P/N 58221 Complete kit for GM V6 models 1983 and up with 3 inch risers. P/N 50300 3" spacer for iron casting. Used to raise height for hose fitting. 6 inch also available. Compatible with port or starboard side of GM V8 or V6 models.